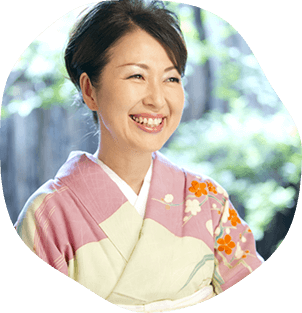 When you come to our office for the check-in procedure, the landlady or a member of the staff will wait for you wearing kimono. Kyoto is the city the most suited for kimono. Even if you are here for a short time please try to feel how beautiful and strong is the kimono culture. 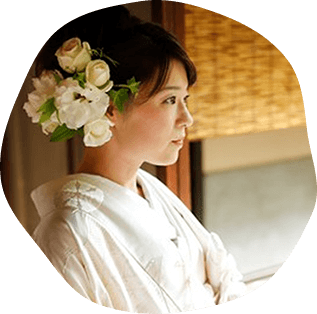 At naokonoza we want to support the kimono culture and transmit the delightful experience of wearing kimono and started a service to rent them. The dressing up occurs at the check-in counter. 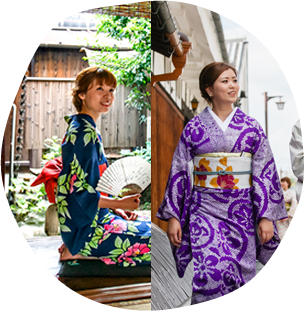 Right after you arrive at Kyoto Station you can change your clothes to wear kimono and go sightseeing. With a focus on silk, retro kimono, our kimono and obi belts were all chosen with great care. The landlady herself put much effort and love to find the kimonos. During summer, you can enjoy the lightness of yukata. 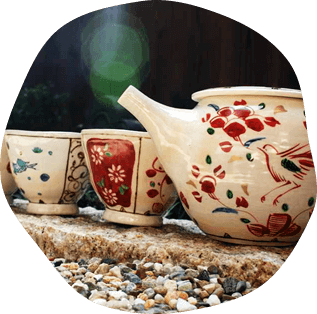 Mr. & Mrs. Horioka's ceramic art atelier DOSEN, is near Chishakuin Temple. Our tea bowls are created by them. Each bowl feels comfortable to hold and they all have beautiful designs. Drinking from these bowls makes tea time more precious. You can buy their products, or even join their one day trial class and make your own to take home. We have picked with great care comfortable bedding that will ensure you a sound sleep. 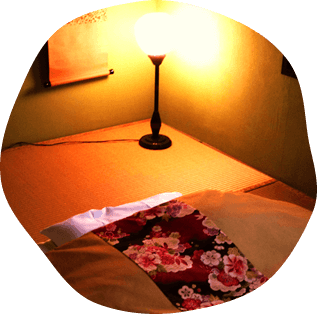 The bed cover full of feathers and the silk floss futon were made with the traditional technique of Kyoto. In each house enjoy the antique furniture. 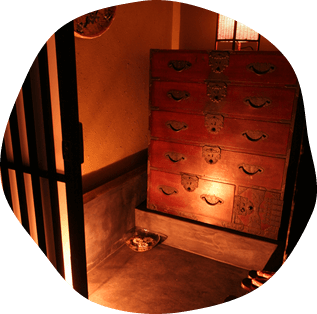 We have collected Taisho-era furnishings which were in vogue when these houses were in use. Fabric items like curtains, TV covers and so on are made from antique Kimono fabric. Enjoy the ambience of bygone days in the house. 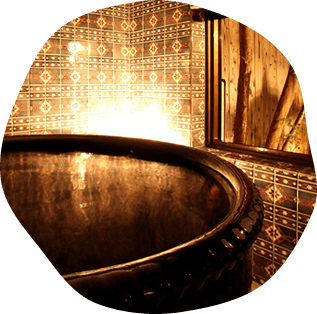 Limited to the Umekoji machiya, it is a plan for customers who have booked for two nights. You can appreciate the pure white of a bride's kimono and the classiness of a hakama. Get lovely pictures of yourself wearing the beautiful and traditional japanese wedding costume ! Before and after the pictures please have a slow relaxing time in the machiya.